What is your favorite meal to grill? Chicken Kabobs are tasty & delish. Taking a shortcut adds lots of flavor & lemon juice and zest help flavor and tenderize. vegetables for skewering - recommend sweet onion red and yellow peppers, zucchini and mushrooms. Whisk the ingredients together in a small bowl. This can be made in advance and kept in the refrigerator for up to three days. Cut the chicken into large 2" chunks and place in a glass dish. Pour the marinade overtop and allow to marinate, turning occasionally for 1 1/2 hours. Cut the vegetables into large 2" chunks, slice the hot links. Assemble the kabobs alternating meat and vegetables. Brush the kabobs with the marinade until the vegetables and meat are well saturated, discard remaining marinade. 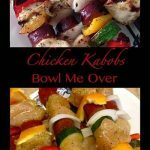 Grill the kabobs 3-4 minutes on each side until the chicken is cooked thru - 9-12 minutes.